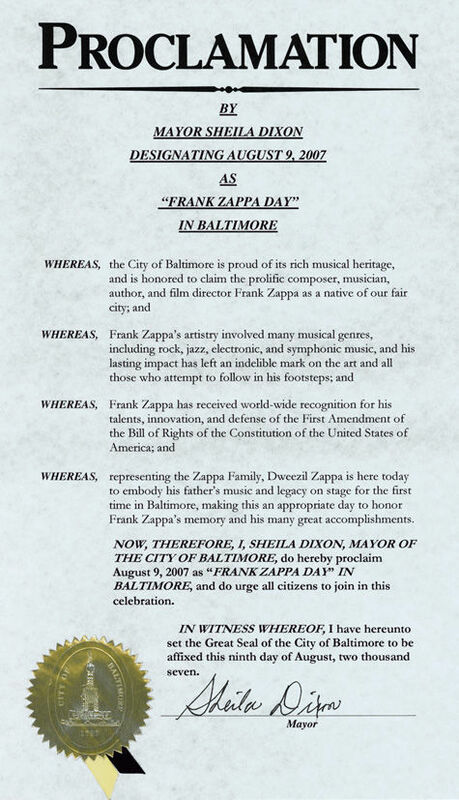 BALTIMORE — Baltimore's mayor has declared a "Frank Zappa Day" on the birthday of the late rocker and native son. Mayor Sheila Dixon declared the special day Monday. The eccentric musician was born in Baltimore on Dec. 21, 1940. He died in 1993. Last week, Baltimore's public art commission decided that it will erect a bust of Zappa outside a public library. The bust was given to Baltimore by fans of Zappa from Lithuania, where his music was popular among the avant-garde in the early 1990s. A similar bust is a tourist attraction in Vilnius, the Lithuanian capital. This entry was posted in Dr. Dot and tagged 9th, august, baltimore, blog, day, dot, dr, frank, gail, maryland, md, zappa, zft by Dr. Dot. Bookmark the permalink.